As you may have noticed, the Handicap Parking Only and the No Parking Anytime signs on the south side of the church were stolen. The No Parking Anytime sign has been replaced by the City Engineers Office, but the Handicap Parking Only sign will not be replaced. This is because this type of on-street handicap parking does not meet city code. The City Engineers Office is removing all such signs throughout the city. To allow handicap parking by the church, we would need to create a new parking lane using the easement between the street and the sidewalk. 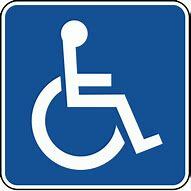 Regardless, please save these spots for the handicapped.